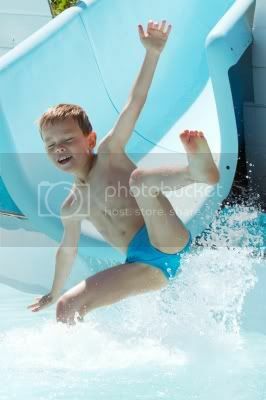 Children love the water especially during hot weather, and pool slides never fail to add more fun to their day. Because they are the ones who enjoy slides the most, safety should always be your primary concern. Make sure to follow the mounting instruction from your supplier and have an expert help you install it. Here are some more fun and safety tips in installing and using your swimming pool slide. Have the slide painted with colorful designs to make it inviting for your kids. Remember that painting the slide on low humidity days will let the paint dry quickly. If you don’t have a fixed swimming pool at home, you can still provide a slide for your kids’ portable swimming pool. Go for an inflatable pool slide that goes down to a portable landing pool. Inflatable pools and pool slides can be built with the help of an electric blower. Determine how high you want the slide to be—a shallow pool needs a shorter slide. Alternatives for above-ground pool slides may be limited but they can be moved around and attached to the pool deck. Moreover, these slides are often much smaller than the slides for in-ground swimming pools. No matter how safe a slide is, children 6 years old and below should not be allowed to use the slide without the guidance of an adult. Keep your kids from sliding with toys in their hands as this could harm them when they slide down the pool. Keep their swimming experience safe by educating them on how to properly use the pool slide and constantly reminding them to be careful. There is a wide variety of slides you can choose from, depending on the size and design of your pool. You can even have them customized so that they perfectly match your home and pool design. Just remember that the safety of your slide is equally important as its aesthetic charm.